Which one will be ousted first? In a regular government, when a Minister is struggling he or she is removed by the Prime Minister. I don’t think anyone has any doubt that the European Union is struggling to get to grips with the Eurozone / debt crisis. So who’s the fall guy? Well, so far, there hasn’t been one, at least not at EU level. It’s high time that changed. The European Commission, the EU’s executive, has a Commissioner for Economic and Financial Affairs – Olli Rehn. Yes, Olli who, you might be asking. While Member States bicker over the future of the Euro, the EU needs a clear line from the Commission, and Rehn – a tremendously cautious politician with non-existent communications skills – has failed to step up. Unlike a national government it’s not legally possible for Commission President Barroso to sack a Commissioner, but he can reshuffle them, so Rehn could be dispatched to somewhere where nothing is expected of him. Until the ratification of the Treaty of Lisbon, the Commission President could not sack any of his Commissioners – since Lisbon (see Article 16 TEU – pdf here) the Commission President has this power, but so far it has never been used. Hence a reshuffle of the Commission is the more likely solution. My favoured replacement in Rehn’s portfolio would be Neelie Kroes – tough, experienced, ready to take hard decisions. Barnier, Kallas or De Gucht would be alternatives. There’s a quick poll – let me know what you think! Who should be Economic and Financial Affairs Commissioner? Left loses, so left might get a liberal Commission President against the wishes of the right – even more confused? All this discussion just confirms the pointlessness of the whole EU project as currently constructed. The only democratic part of this is that theoretically our parliament debated the Lisbon treaty then adopted it – although the fact that not a single word was changed highlights how undemocratic it was in reality. If we are to be part of the EU it has to be democratic. There should be clear demarcation between the responsibilities of the EU federal gov. and the govs of the individual countries. The EU federal gov and it’s leaders should be elected by us all but with their actions controlled by a constitution that we should also play a part in debating developing and installing. A Commissioner has not the same power and responsabilities of a finance minister of a State, so this post has no sense, IMHO. Maybe could have it when the financial governance will eventually be reinforced. Actually the Treaty of the European Union have been saying since Nice (and made easier with Lisbon) that “A member of the Commission shall resign if the President so requests.” (article 17(6) TEU) and the framework agreement between the Commission and the Parliament reads that “5. If Parliament asks the President of the Commission to withdraw confidence in an individual Member of the Commission, he/she will seriously consider whether to request that Member to resign, in accordance with Article 17(6) TEU. The President shall either require the resignation of that Member or explain his/her refusal to do so before Parliament in the following part-session. ” So theoretically Barroso could remove a Commissioner, or at least the EP asks him to do it…. Then of course, the corresponding member states would have to replace “its” Commissioner….. I voted “No change”, because I’m against reshuffling Olli Rehn: I’m in favour of sacking him. Jon, contrary to what you’re saying, the Commission president can sack a commissioner (TEU article 17.6. ), and the Parliament can make him sack one (Commission-Parliament framework agreement of 2010). So why bother playing musical chairs? But I agree I would be far more happy if the MEPs dismissed Barroso. @Jon at a point where talking too much means crashing stock markets, I’d rather get rid of Oettingers loose lips than Rehns adherence to the commission line. I would love having Rehn speak out in Europes interest regarding the financial situation, but the financial situation is really political and that makes it rather complicated for the commissioners. At least Barroso is now talking about the only possible alternative to euro-zone breakdown, federalism. If the rest of the commission would/could follow I would love to hear Rehn explain that the solution is to not let Merkel act in the short term narrow interest of the German electorate, and instead let Europe act in the short and long term interest of all Europeans, including the Germans. The current imbalance (trade, financial and political) is not sustainable and a bankrupt South just means that many fewer buyers of German goods. 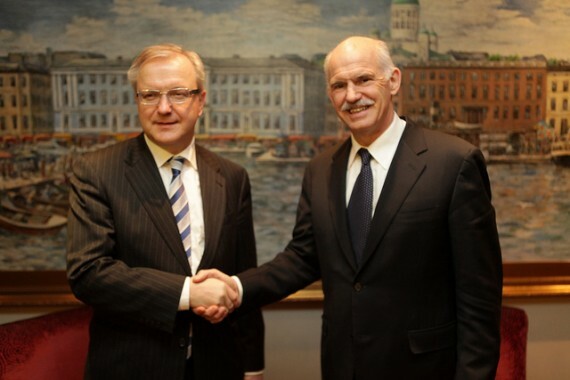 I thought the Rehn issue solves itself when he becomes president of Finland. But that still leaves the valid point of who is take charge. While EUropeans unfortunately cannot remove Merkel, they should consider if Barroso is the right man for this crisis. Has anyone heard any useful statement of him? Why does he let ever more power slip out to von Rompuy? Like Dániel Fehér said, this is a very strange argument and post from you Jon. If anything Olli Rehn has been one of the stable characters in this drama. Of the commissioners Günther Oettinger would be more reasonable to reshuffle, if not Barroso as Dániel suggested. If anyone needs to go because of the Euro-debacle it should be Merkel, lying to her own constituents (greeks are lazy) and blocking any meaningful action in the council..
Daniel – the Treaties do not rule out or rule in the Commission in devising a response to the Euro crisis, and it’s clear that the Member States are not acting. The job of the Commission is to defend the EU interest, and that is clearly not being done. Yes, of course I would prefer to oust Barroso, but that is not going to happen. Rehn has been a major disappointment, and moving him would be viable, that’s why I advocate it. @Dagmawi – happy to shift Oettinger too, but he has only a bit-part in the energy portfolio. Rehn has been stable in that he has consistently done nothing and said very little. We need more than just silence from the Commission! As for Merkel – she is democratically accountable to the people of Germany, and as a result has to act in their interests. I think she’s taking the wrong decisions for Europe, but I can understand how she is thinking.